The health benefits of almonds have been documented for centuries and modern research is backing up many of the claims. The simple almond is a true health food. Nuts and seeds are the vegetable foods that are richest in fiber after cereals, which could explain why almonds are good for cardiovascular health. Almonds also contain high levels of healthy unsaturated fatty acids in addition to a lot of bioactive molecules (such as fiber, phytosterols, vitamins, other minerals, and antioxidants) which can help prevent cardiovascular heart diseases. For years, we have known about the amount of protein they contain, but now we are finding out more great health benefits of this tasty nut. Approximately 1 ounce of almonds have 1/8 of our daily protein needs. Almonds increase the levels of vitamin E in the plasma and red blood cells which helps to lower cholesterol. A study published in the Journal of the American Dietetic Association found that eating a handful of almonds a day is a great way to get the vitamin E your body needs to stay healthy. Vitamin E is a powerful antioxidant that defends your cells against damage on a daily basis and prevents artery-clogging oxidation of cholesterol. 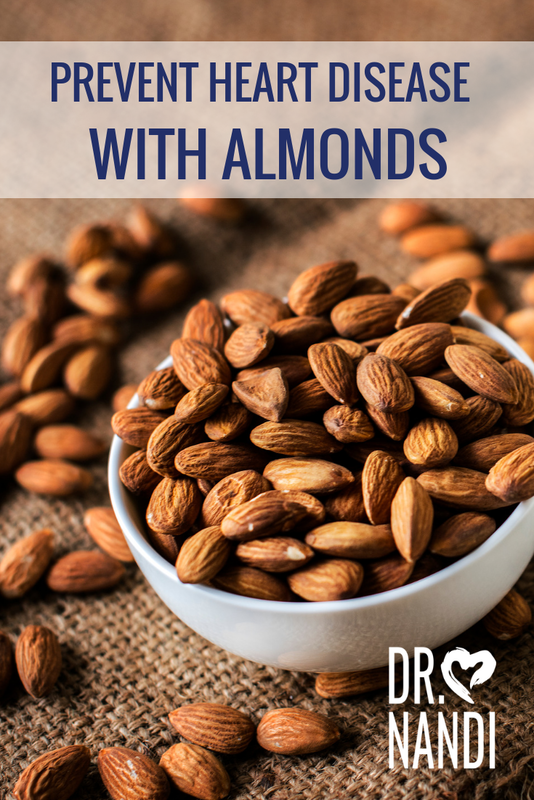 In the journal, Circulation, there was a study published that discovered “almonds used as snacks in the diets of hyperlipidemic subjects significantly reduce coronary heart disease risk factors, probably in part because of the nonfat (protein and fiber) and monounsaturated fatty acid components of the nut.” Almonds, along with nuts and seeds in general, are often associated with improved levels of blood lipids and being good for the heart. 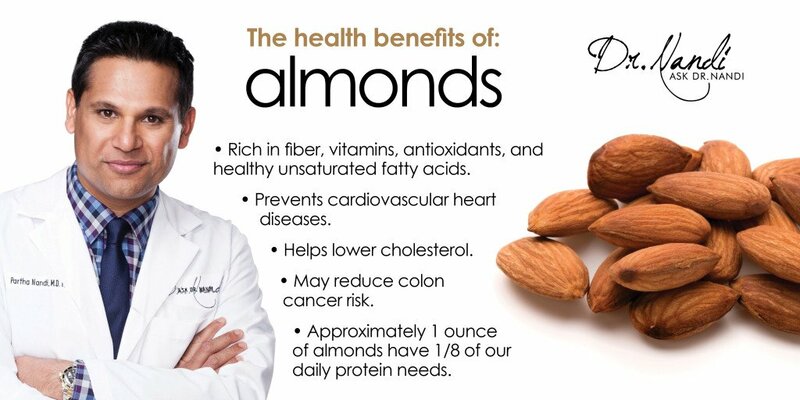 Recently researchers have studied almonds and their effect on the prevention of cancers, most notably colon cancer. The results suggested that “almond consumption may reduce colon cancer risk and does so through at least one almond lipid-associated component.” Another study published in the journal BMC Medicine concluded that people who regularly eat nuts are at a lower risk of death from cancer. In the New England Journal of Medicine, a study was published that found that people who eat a handful of nuts every day live longer than those who do not eat them at all.